A previous blog on Glenn Ford attracted attention (most popular post of 2014 so far). Nostalgia is an indulgence as we age. Ray Milland was in a number of enjoyable movies that few seem to recall. In the latter part of his career he performed in a number of B movies that may have sullied his reputation, but if you like old movies you might enjoy checking some others that made him a star. Raymond Milland was born and raised in Wales. His early interests were sports. He was an accomplished horseman and part of the Household Cavalry that guarded the Royal Family. He worked his way up in the films and by the 1930's he was well established at Paramount. 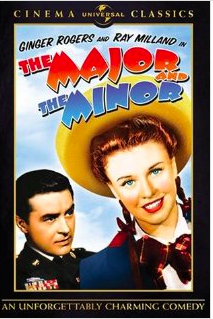 In "The Major and the Minor "the plot stretches credibility a bit, but is enjoyable once you accept the premise. This gorgeous woman (Ginger Rogers) is forced to pretend to be a young school girl to save money on a trip back home and meets up with a major who wants to get into the war while his fiancé is sabotaging his efforts to keep him at a military academy. Lots of juvenile humour, but the romance does get through. In "Beau Geste" Gary Cooper is the lead in this romantic adventure story. I was young when I first saw this movie and was fascinated by it. You realize at the very end that the Gary Cooper character arranged an adventure to save the honour of his aunt. In the end Ray Milland gets the girl. 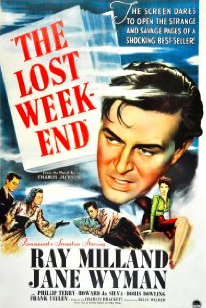 "The Lost Weekend" was his most famous movie where he won an Academy award. Billy Wilder took a chance to offer a more challenging role (others had turned it down). After seeing the script he said he would have to give his acting more serious effort. He was never given another such role. "The Big Clock" was suspenseful. Charles Laughton was the bad guy who tried to frame Ray Milland and had him cornered. Saturday Night at the Movies on TVO ran an interesting double feature- with "No Way Out" starring Kevin Costner in an adaptation of the same plot. 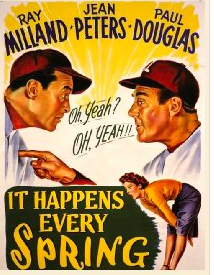 "It Happens Every Spring" portrays a fantasy of lot of men who fancy if things were just a little different they could be a big major league baseball star. Ray makes a flukey discovery in a laboratory that allows him to pitch a baseball that is almost impossible to hit. The mechanics of his discovery would have had other applications, but baseball was his passion and he disappears to indulge his fantasy. A lot of laughs and you find yourself rooting for him. In "Love Story" he plays a cold hearted father while Ryan O'Neal and Ali McGraw make us cry. In "Dial M for Murder" Raymond is again not a nice guy. Alfred Hitchcock lays a lot of suspense also using Grace Kelly and Robert Cummings. Somewhere around in the 1950's he became involved with B movies. "Panic in Year Zero" was one I saw. and enjoyed a bit. 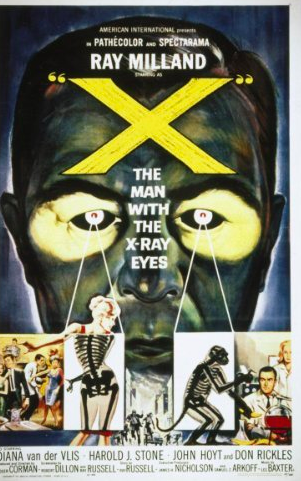 "The Man with the X ray Eyes" is one I vaguely remember this when as a youngster I watched a lot of B movies. A critic, Michael Almereyda on a special feature thought that this was one of Ray Milland's better performances, even than "The Lost Weekend." "Man with Two heads" is one I didn't see nor do I wish to. He is one of the two heads. In getting prepared for this post I watched a few movies I had missed. "Ministry of Fear" was one of his better ones made in England during World War II. In "Reap the Wild Wind" he played an unusual role that saw him actually defeat John Wayne in a fight while playing a foppish lawyer in the deep south during pre Civil War times. "River's Edge" makes him a cold blooded killer ironically fighting with Anthony Quinn who seems more natural in the heavy roles. I look on Ray Milland as a sophisticated nice guy. I was shocked to see him in negative roles. However as I mature (?) I appreciate versatility in actors. He had stated that he looked for originality in scripts as one rationalization for his choice of roles.